Helpful guide to prepare for USMLE exam online and various books. There are various options available to prepare for USMLE. Broadly the preparation materials of USMLE can be divided into; online, books, lecture videos/audios and smartphone applications. Real exam scenario – The USMLE step 1 / 2 CK and 3 are all computer based exams. The online material providers also continuously update their question bank. Some of them are even compared to real exam scenario and the assessment modules are comparable to the real exam score. USMLEWORD, BECKERS, NBME, KAPLAN and USMLERX – These online services are paid and can be purchased for weeks, months and year. Payment is done by securely online by credit cards. The examinee can use the paid service many times as needed during the subscription period. There are special discounted fees on extension of the subscription. 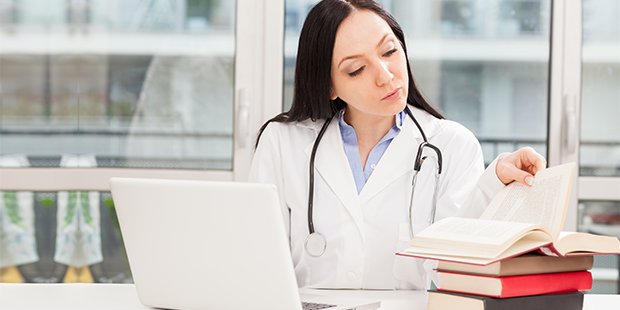 The knowledge from books form the core of the examination.Though many books are available for all the USMLE steps, some books are considered as fundamental preparatory material. Some of the books provider being; BECKERS, BRS, KAPLAN and many others. Many of these books are available on amazon and other online books markets. I request the examinee to refrain themselves from downloading free examination materials available on the internet, the reason being most of the material is outdated and will definitely harm your preparation. Some of the books are also copied and made available in book store, but again the copy quality and degraded images hampers your preparation. USMLE Step 1 has many publisher books and entire subject wise question sets available, hence my advice to the examinee would be to make a personalized preparatory module with guidance from seniors or an appropriate mentor and follow it rigorously. Some of countries have USMLE professional coaching facility available. They offer classroom coaching and online preparation for USMLE. In India, USMLE professional coaching is provided by BECKER- EDUPRISTINE, KAPLAN and some local agencies. Along with online videos, they also provide interaction with US medical faculties. To help more in USMLE preparation, audio mp3 files can also be downloaded on your smartphone and can go through whenever possible. I also encourage the examinee to attend or subscribe to many webinars or seminars held free to assist and guide in their preparation. Again, please refrain downloading from the internet as most of the material available are outdated and the USMLE curriculum has underwent a transformation since then. Most of the online USMLE provider and book publishers have their customized smartphone applications and can be downloaded for the APPLE apps store or ANDROID play store. A search of USMLE on the respective app store will enlist all the available USMLE apps and can be downloaded free or paid online easily. Are You a Prisoner to Your Exam Fear?